This is my log for the overclocking session I ran this afternoon (may 22nd 2016) for the ProOC Championship Round 2 Stage 2 on SuperPi 32M … errr sorry, SuperPi 1M (I keep getting that wrong … I’m so used to saying 32M). The plan today was to get a validation screenshot which I failed to get on Thursday. And success! I managed to beat my personal best, something I wasn’t able to do on Thursday. So my final score came in at 5sec297ms (see screenshot below) beating my previous personal best which was of 5sec444ms. Overall I’m quite happy. With this new personal best, it puts me into 4th place globally with this CPU and second place for the current submitted scores in the ProOC Round 2. I’m leaving for Taiwan on Friday. So the last stream that I will be doing before that computex trip will be on Tuesday night (tonight). And then I will bring another stream to you on Thursday night with a little something somewhere along the lines of : “what’s in my bag” / “what am I taking with me to Taiwan for overclocking”. Don’t forget to subscribe to my YouTube and Twitch channels to stay informed of when I go live. 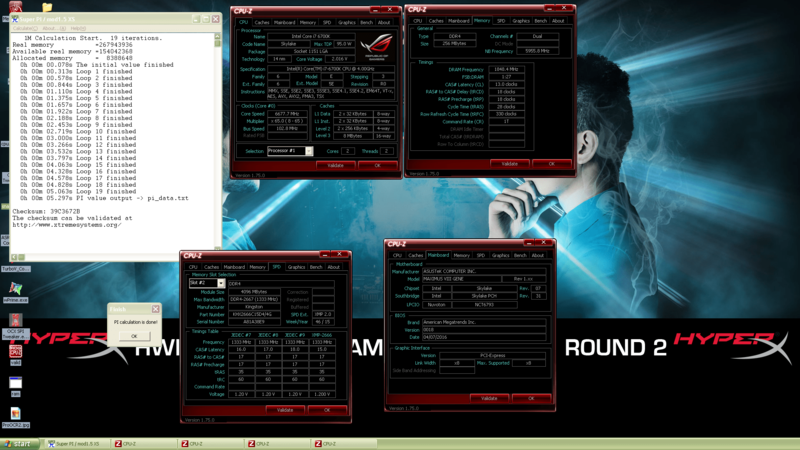 This entry was posted in Overclocking Worklog and tagged asus, cooler master, hyperx. Bookmark the permalink.